During the week of 21-31 May 2014, I took part in an implementation support mission in Ethiopia, visiting the IFAD-funded Participatory Small-Scale Irrigation Development Project (PASIDP). This project focuses on improving nutritional status of poor rural families and aims to make the rural households more food secure. I was delighted to visit Homicho Sogido, one of the PASIDP ongoing small-scale irrigation scheme in Oromia region whichregion, which incidentally is one of the most food insecure communities. The livelihoods of smallholder farmers in this community predominantly depends on chat cultivation – which is a major cash crop. Chat, also known as khat, miraa, or gat is an amphetamine-like stimulant plant. The main staple crops in this community are exclusively sorghum and maize, thus the monotonous dietary pattern. Regular diet in this community, before PASIDP was the traditional injera accompanied by wat. For those who may not know what injera is – it’s a sponge bread made of maize, sorghum and teff flour. And wat is a hot spicy stew made of hot pepper and spices. The communities benefitting from the Homicho Sogido small-scale irrigation scheme now have a better understanding of nutritional value of vegetables. Before the project, farmers were not familiar with vegetables like cabbage, onions, tomatoes, carrots, beetroot, swischard. The farmers told us that they did not even know how to cut onions. It was heartwarming to see an increase in consumption in of vegetables, which has improved the health conditions of the households. “Thanks to the training on high nutritious value vegetables provided by PASIDP, “I am now better equipped to debunk the myth that family planning is the cause of anemia”, said Burtukan, who is an extension worker. “Over time I was able to raise awareness about the micronutrient potentials of vegetables, thus improving the nutrition and health conditions of the rural households”. The introduction of crops diversification was a welcome development to their monocropping practices. Farmers acknowledged that cultivation of chat, which is their traditional main cash crop, while a “viable” source of income, however, regretfully has led to poor diet and resulted in malnourished and sick children. Extension agents offered the women in the community training on how to crop, irrigate, harvest, process and cook vegetables. 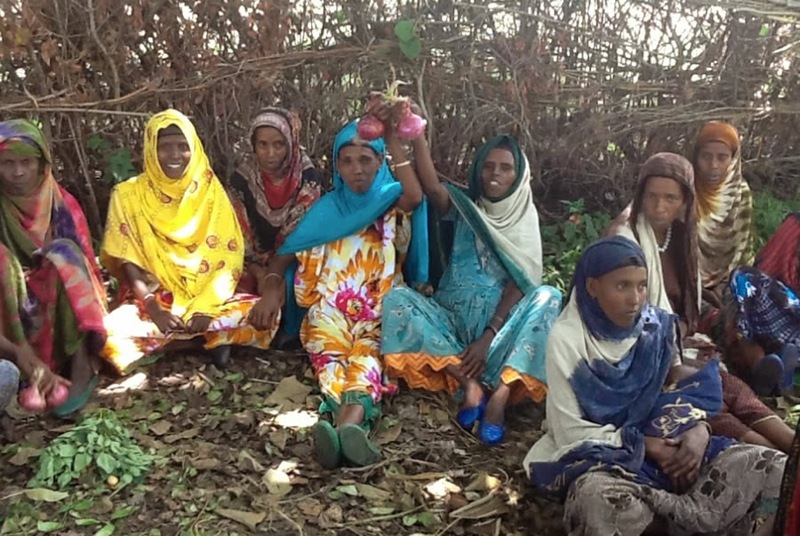 Thanks to these trainings, the communities’ traditional dish (injera and wat) now includes vegetables; onions, cabbage, tomatoes and potato which has resulted in diversified, healthier and more nutritious diet. I was impressed when the fathers said that, they too, are making sure that their children eat meals with vegetables. In my line of work, when I see integration of activities that facilitate nutritious food intake at household level, I can see a clear and an effective pathway to accelerate nutrition in an agricultural and rural development investment. And this is what I saw at the IFAD-funded Participatory Small-Scale Irrigation Development Project (PASIDP)!